Kids’ bedrooms are the topic of many household arguments. Shoes, toys, clothes, rubbish and much more can often be found thrown on the floor. It tends to be the adults that are begrudgingly left to constantly pick up the mess. 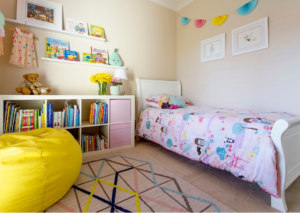 Empower the kids with the right tools and skills to organise their own bedroom with these 4 easy steps. You will be delighted with the results, the reduction of stress and the pride the kids start to take in their own space. Kids clothes will most likely need to be washed every day when the kids are small (often multiple sets of clothes a day). However, when they can control a spoon a bit better, and are at school instead of playing in puddles at the park, they may be able to wear their clothes for more than one day before it’s washed. Show the kids how to look out for marks on their clothes as they take it off. And encourage smelly teens to make sure they put their clothes out to be washed on a regular basis. Choose a fun design that is roughly the same size as the washing machine. Show the kids how to put their clothes in the wash when the basket is full of dirty clothes. I found some cool washing baskets on Pinterest. I also found some great ones at K-Mart too. 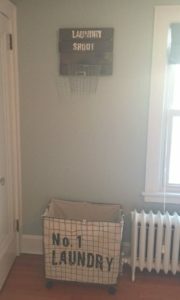 My boys always try to throw their clothes in the basket from a distance, so why not put a hoop over the top of it!? The end of the bed, allocated “airing hangers” in the wardrobe or on a night stand will do just the trick. Teach your kids the skill of letting go of stuff by making conscious choices about what they want to keep and put on display and what they no longer need. I’ve written quite a lot about this including the blog Letting go of kids’ keepsakes. Set up a pinboard or display shelf for the kids to display the artwork they choose to keep. Make time for the kids to rotate the artwork regularly, allowing time to dust and declutter as they change over the collection. Make sure there is a rubbish bin in each bedroom room. The bin should be emptied each week when the other household bins go out. Set up a permanent home in the bedroom for the kids’ stuff and encourage them to return them to their home before they get into bed each night. Shoes – dedicate a tub or rack for shoes to be stored. My boys have a shallow wheely tub under their bed for shoes. Another family I know keeps their shoes in the garage so they can take their shoes off on the way into the house from the car. 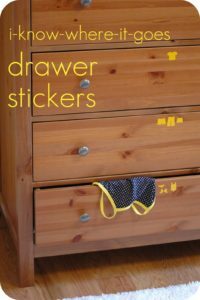 Clothes – label drawers so the kids can find clothes and put them away themselves. As mentioned above, where are clothes going to go when the kids take them off? Toys – provide easy to use containers so that toys can be thrown in before bed. Need more help with toy storage have a read here. With the right tools and a little encouragement kids will begin to take pride in their bedroom by getting involved in these 5 easy steps. If you still need help getting the kids to stay organised contact me here or you can book me here so I can save you the arguments by working on the room with the kids.